Karale til is not commonly used in many households. It is rich source of Calcium. You can try this tasty chutney made from Karale Til. This goes well with any Chilla, Ghavan and curd rice. 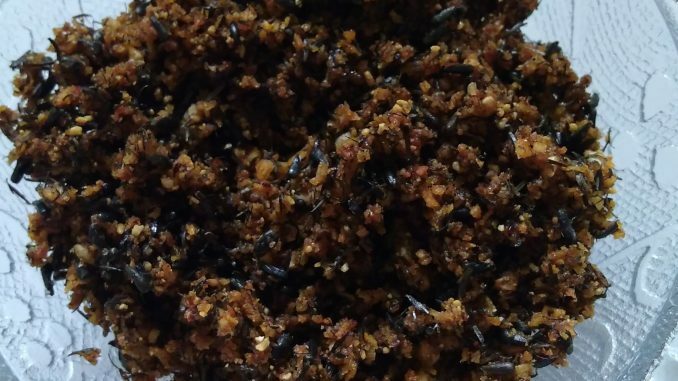 Karale Til are called Khurasni in Gujrati, Ramtil in Hindi and Niger seeds in English. 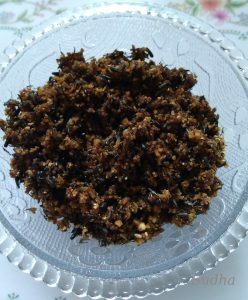 In case Karale Til are not available, you can use black til (Black sesame seeds) for this chutney. The texture will be little different but the taste is very good. 1. 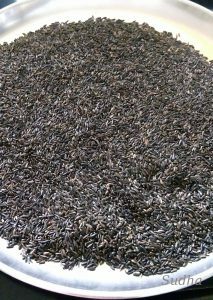 Roast Karale Til / Khurasni / Niger Seeds evenly till they start sputtering. 2. 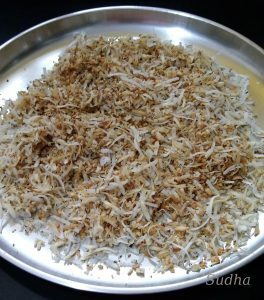 Roast the grated dried coconut till it is light brown. 3. Peel the garlic cloves. 4. Transfer Karale til in a grinder. turn the grinder on pulse for three or four seconds. avoid pulsing it for more than a few seconds, or oil will be released and it will form clump. attempting to grind too many seeds at once may also result in clumping. 5. On cooling grind the roasted grated coconut in a grinder to get coarse powder. 6. Crush garlic cloves separately into a smooth paste. 7. Add salt, red chilly powder, jaggery, tamarind and mix well. 8. Add Karale til powder, coconut powder to garlic mixture, grind to form a uniform mixture. This chutney lasts for 2 to 3 weeks if stored in air-tight container. For best texture, grind this chutney using mortal and pastel.